The Trisuli, river of the Trident and of Shiva is the best introduction to wonderful rafting (you can take a trip for) one to three days on the way to Chitwan National Park or to Pokhara, The Sunkosi, River of Gold is for the true white water enthusiast lasting 10 days, The Tamakosi, River of Copper. 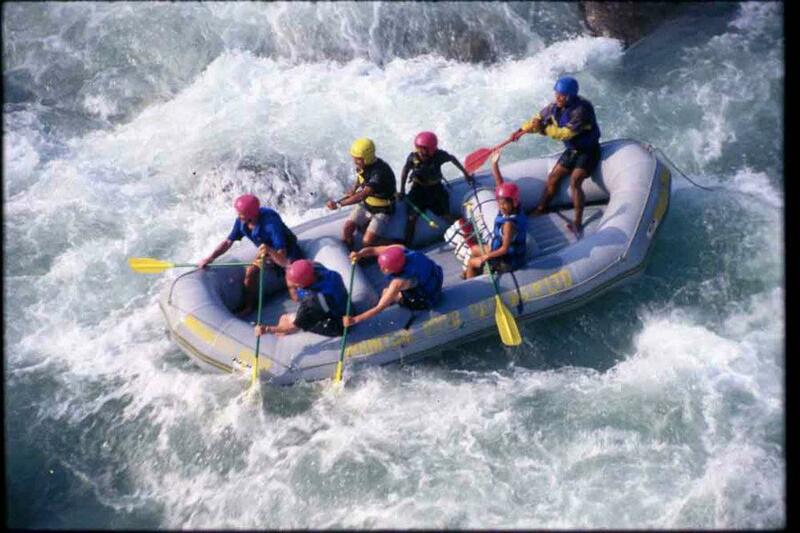 The beautiful River, Kaligandaki for 5 and 8 days is one of the best white water rafting in Nepal. The Arun, The Marshyangdi, the Seti for a perfect family expedition for two to three days , the Bheri, and the Karnali, fast flowing and deep, sparkling clean water, strong rapids, untouched and unspoiled river for 10 & 15 days, Tumbling downwards from the mountains, all having their sources in the glaciers draining the slopes of one or other of the great peaks, these mighty and powerful rivers cut through the Nepali countryside, swift and turbulent sometimes, placid and calm at others, providing an exhilarating means of viewing and ever-changing scenery. Please write us for Particular River of your interest. Please write us for day-by-day itinerary and its cost. TRISULI: Class I to IV, One to six days. The best introduction to wondrful rafting. Fit for every one: children old and young. SUNKOSI: (River of the Gold): Class I to V+, Ten days. No turning back till the end One of the world’s ten best rafting rivers. For the true white water enthusiast. Easily accessible. SETI: Class I to III, two to three days. Only mid September thru mid December. Technical rapids. A perfect family expedition for those who like their waters white and mild with a little less splash. Easily accessible. KALI GANDAKI: Clas I to III, three days. You will shoot tame but exciting rapids then relax while floating gentle through scenic valleys and countryside. KARNALI: (West Nepal): Class I to V+, Ten or fifteen days. No turning back till the end. Fast flowing and deep, sparkling clean water, strong radpids, big water volume river. One of the world’s best rafting rivers. Great beaches and thick jungle, untouched and unspoiled area. True and challenging white water. Accessible by short trek after drive to Surkhet. BHERI: Class I to IV, four days. Best introduction to white water. An excellent river for the adventurous to thrill both intermediate and advanced paddlers. Beside these, we will be pleased to offer any assistance in arranging white/scenic water rafting and kayaking trips on other fascinating rivers of Nepal such as Tambakosi, Marsyangdi and other mighty rivers. Class I. Relaxing- Waves so small you may not even get wet. Class II. Easy does it-Clear passage and moderate waves. Class III. Adventurous-Lots of water slide. Like waves and eddies, rapids with clear passage. Good family adventures ! Class IV. Thrilling-Long rapids, powerful waves with big hole. Class V. Awesome-Long exciting rapids, big technical drops and steep gradient. Class VI. Don’t try It- This is a novel alternative to jumping of the high bridge. List of Items required for rafting. PLEASE TRAVEL AS LIGHT AS YOU CAN. At least two extra sets of dry clothes. As it is cold from November through February, a waterproof jacket will be very handy. While trousers, pullovers or jackets are needed for the morning and evening, during the day, shorts and T-shirts will suffice for the month of September, October, March, April and May. As clients will arrive completely soaked on shore at the camp sites, immediate change into a dry set of clothing is necessary. Tracksuits are the most popular item for any rafters. A second pair of tennis shoes or slippers for use around the camp. Protection from the sun such as sunglasses, sunhats, cream and lotions to prevent sunburn and insect repellants during the warmer months. Electric torch lights as the use of candles is not advisable inside the tents. Traveler’s Insurance – do this at home.